Semipermanent lakes within the Hattah-Kulkyne National Park were topped up with environmental water in 2015–16, providing an opportunity for native fish to move freely between the lakes and the River Murray. Native fish (such as golden perch and gudgeons) use the Hattah Lakes as safe refuges to breed and grow, before returning to the main river channel. Black box trees in the northern Hattah Lakes system also received a boost as a result of past environmental watering. "A report looking at the influence environmental watering has on the reproduction and health of floodplain black box in the northern lakes system of Hattah showed that due to past environmental watering, there was an increase in seed release and fruit abundance for black box," said Mallee Catchment Management Authority (CMA) Chair Sharyon Peart. "This is great news as black box trees were hit very hard during the drought and have only started to recover over the last few years. 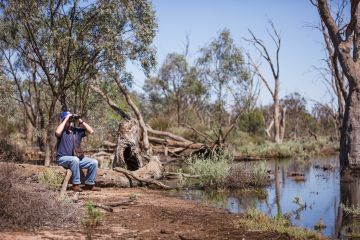 The black box trees at Hattah are one of only a few intact communities left of this species in Victoria." A report evaluating the effect of environmental watering on the plants of Lake Bitterang found it helped increase native plant richness and abundance. Surveys done over three years from 2013–15 also show regent parrots are nesting near infrastructure used to deliver environmental water at Messengers and Oatey's Bend. The Hattah Lakes are a popular place for camping, kayaking, bushwalking, recreational fishing, birdwatching and photography. In 2015–16, the Mallee CMA launched a children's activity book, Wildlife Detectives, based on local plants and animals. The book is available for free at the Hattah-Kulkyne National Park information centre. Environmental watering of the lakes helps to support recreational and educational activities, which contribute to the local community. The lakes are greatly valued by Traditional Owners in the region, who have a continuing connection to the land. The area contains more than 1,000 registered Aboriginal sites including burial sites, scar trees and shell middens.